Disclaimer: This post is sponsored by Udi’s Gluten Free, but all thoughts and opinions are my own. As of last week we now have three teenagers at our house. Overall that is a good thing and I have no complaints. Sometimes I really do miss the kids being little, but so far I can’t complain about the teen years. Except the food. Can we just talk about teens and food for a minute? Seriously where do they put it all? I recently asked my son how many pieces of pizza he had and the answer was I had 8 or 9 pieces, maybe more, plus three pieces of dessert. To which I answered something like where do you put it, that is more food than I ate all day. Now for reference my son is currently wearing a size 28×34 for pants. And when we measured him last week we realized that he had grown 3/4 of an inch in three weeks and about 1 1/2 inches in less than 2 months. I think I know where all that food is going. He is definitely a growing boy and it is all in his height right now. One of the things that I have realized is that my son, and my daughters too, are needing more protein. I think they are even noticing that they need more protein at meals. They might not be conscience of needing it, but it is the food they are tending to gravitate to. I think their bodies know they need it and they are craving it. They are wanting and needing food that sticks with them and food that is not full of too many carbs and sugar. As I have mentioned before we are a nut free home due to my daughters tree nut, peanut allergy, which makes the whole protein issue a bit more challenging. Peanut butter on toast is a no go at our house. As is peanut butter and jelly and a host of other foods that tend to be easy stick with you type of foods. I love quick and easy which again can be challenging when dealing with starving kids, food allergies, and 3 out of your 5 family members eating gluten free. Right now I kind of feel like I am constantly feeding my kids and buying groceries. Which I know many of you can sympathize with. I was recently looking around the Udi’s Gluten Free site for some recipe inspiration. 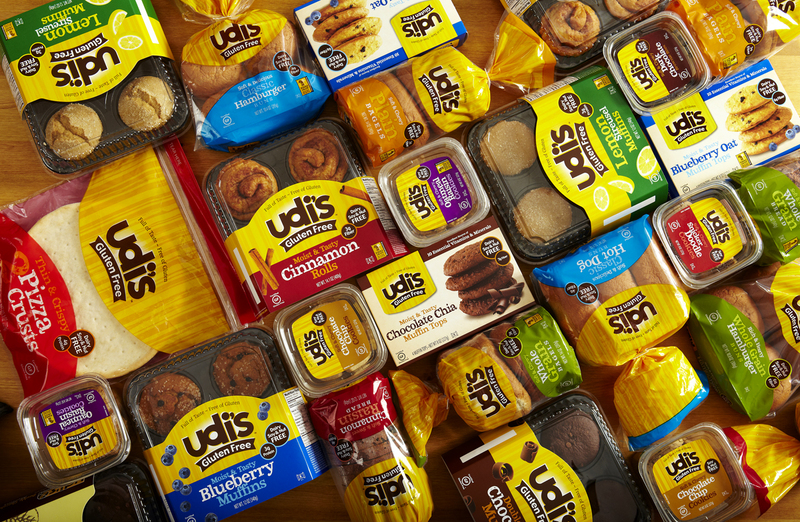 If you are gluten free and have never looked around the Udi’s Gluten Free Site and Community you should. It is a great resource. One of the recipes that caught my attention was a bagel breakfast sandwich. My girls and I love Udi’s Gluten Free Bagels, so I knew we would love the recipe. I also knew that since my husband and son are not gluten free, it would be an easy recipe to adapt for them using regular bagels. 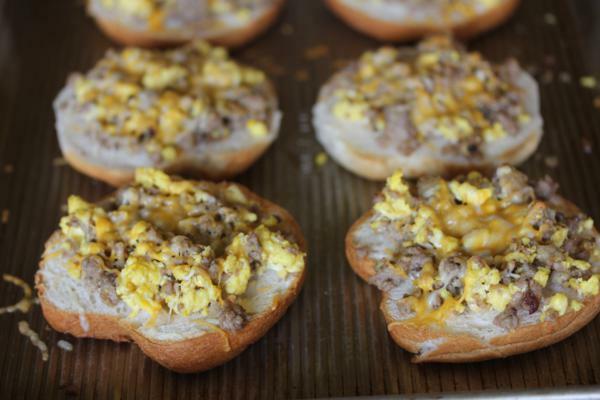 I used the recipe as an inspiration, but totally made it my own version of an egg and sausage bagel breakfast sandwich. I made these one day for lunch last week and my kids loved them. What I loved about these was how easy they are to freeze. All you have to do is make them up and freeze them instead of baking them. For a quick meal just heat them in the oven or toaster oven. Quick, easy, delicious, and filling! All the things that are necessary when feeding teens. Or really anyone. This is a breakfast that anyone will enjoy! Cut bagels in half and lay each half on a cookie sheet or baking pan. 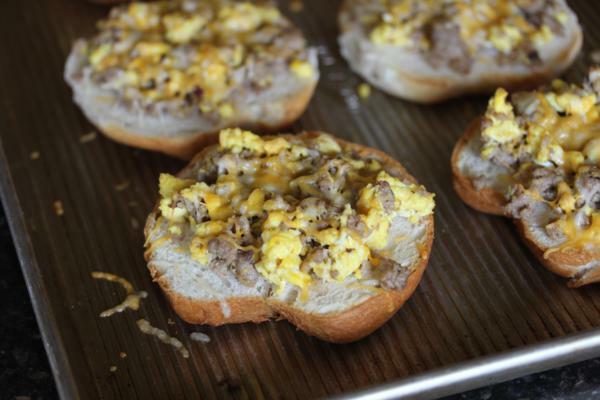 Divide cooked eggs and sausage evenly over the bagel halves. Bake at 400 degrees for 8-10 minutes or until bagels are lightly toasted and cheese is melted.